Written in the caption: "WITH UTMOST CARE. 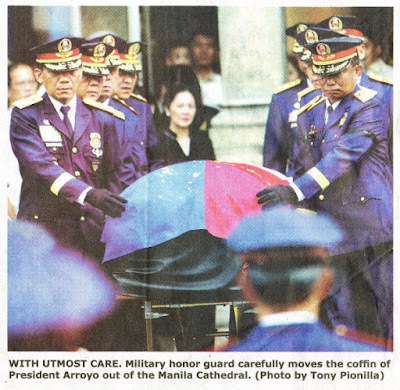 Military honor guard carefully moves the coffin of President Arroyo out of the Manila Cathedral." Of course, we know that this is just a pure mistake of unavoidable typo error (Freudian slip in a more scientific term). In fact, a lot of news anchors have also been trapped on this "mind twister" like Tina Monson Palma, Arnold Clavio and another field reporter (I forgot the name) who all mistakenly said Arroyo instead of Aquino. I find this photo worth sharing and I just can't believe that even big newspaper companies commit such controversial mistake. What do you think will be Malacañang's reaction on this especially Mrs. Arroyo? Leave your comments.